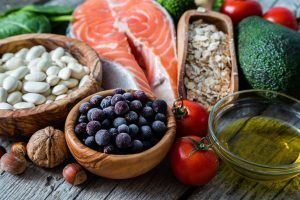 Healthy eating does not necessarily deprive you of your favourite food or limit your dietary boundaries, instead, it’s about eating right to increase your energy, and also your health. It doesn’t have to be complicated, it just involves balancing the nutrients in your diet. Including carbohydrates, fibre, protein, fats, and calcium in your diet will help you avoid certain health problems and will have a serious effect on your weight and mood. Fat; It supplies the body with heat and keep the brain and heart protected. Carbohydrates; It is the main source of energy for the human body. Fiber; It lowers every risk of heart disease, and stroke as well as improves the skin. Calcium; It is for building strong bones and teeth, and it helps regulate the heartbeat. Start eating smaller amounts and reduce your intake of junk food by eating lots of fruits and vegetables daily since they are low in calories, and rich in nutrients. Replace junk foods with healthy options, and you can start by adding salads to one of your meals every day. Take charge of what you eat by cooking meals at home as this means you know the composition of your food. Be cautious of packaged and processed foods since they may have some hidden contents present in significant amounts; like sugar and fats and lastly, drink water a lot.